The last ten days have been exciting, to say the very least. Gretchen and I had planned to hold our annual online fleece sale this last Wednesday. All of our preparations went smoothly, until we discovered a computer error in all of the advanced notices which we had sent out. Luckily, that discovery was early enough that we managed to get an updated email sent in time to everyone concerned. This was also to be the first time that we had held the sale since we had redesigned our website. We were not certain how well the site would work and had no way of knowing until the moment that the sale began. Thankfully, the website functioned flawlessly. As usual, the first hour and a half of the sale was totally chaotic for the two of us. I am sure that many of our customers were frustrated by their inability to get through on the phone and the slow email response times. Nevertheless, virtually all of the fleeces were sold in the first two hours. And, as of Friday afternoon the very last fleece was sold. It has been a long time since we sold out that quickly. We thank all of our customers for their loyalty and their patience! 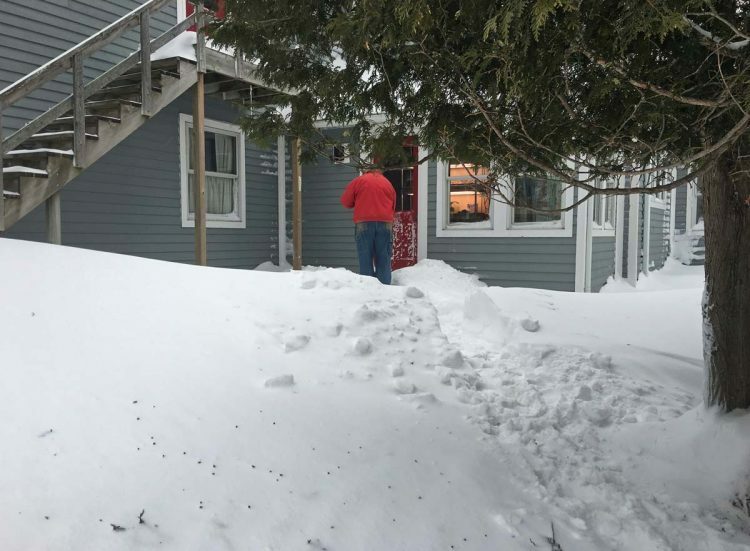 What many fleece customers did not know was that the fleece sale was sandwiched between a record breaking blizzard and long hours of subsequent snow removal. The storm did not sneak up on us. On Thursday, the 12th of April, nearly all of our winter’s snow had melted and the third wave of migratory birds had just arrived in force. The arrivals, loads of Yellow-Rumped Warblers, Flickers, and Eastern Phoebes are all insect eaters. Robins had arrived earlier, but they too are dependent upon bugs, worms and fruit. Snow was predicted to begin over Friday night and build into a blizzard Saturday through Monday morning. The prediction for Friday night snow fall was 3″. This is what 3 inches looked like early Saturday morning. Needless to say, the 3″ was closer to 12″. 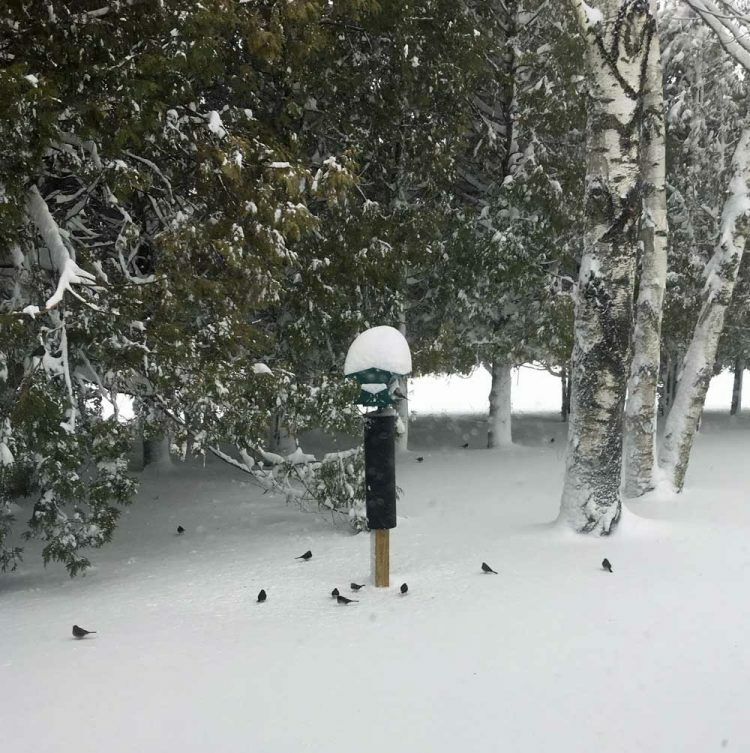 As indicated by the snow cone on the bird feeder, the wind had not yet started to blow in earnest. The snow came in waves on Saturday, again on Sunday and early into Monday, but once the winds started they did not let up. Wind speeds were up to 40 mph, out of the northeast. Sunday morning this was the view from our kitchen toward the barn. 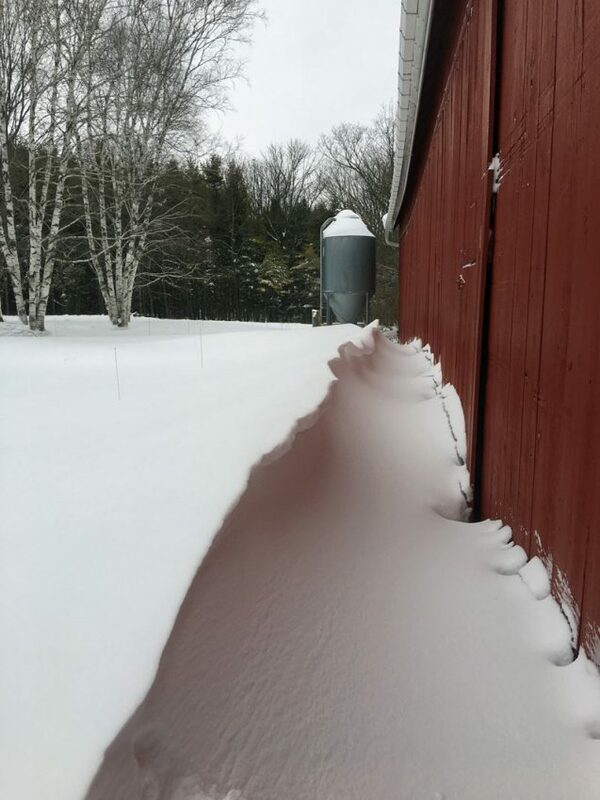 The drift in front of the barn door was already over 4 feet tall and growing. Yet, right next to the drift the ground was blown clear. The trips to and from the barn were true adventures. We had to shovel through a deep drift outside the back door and then shovel a path around the cedar tree to get to the small clear area. Then we had to shovel a path through the drift in front of the door to the barn. 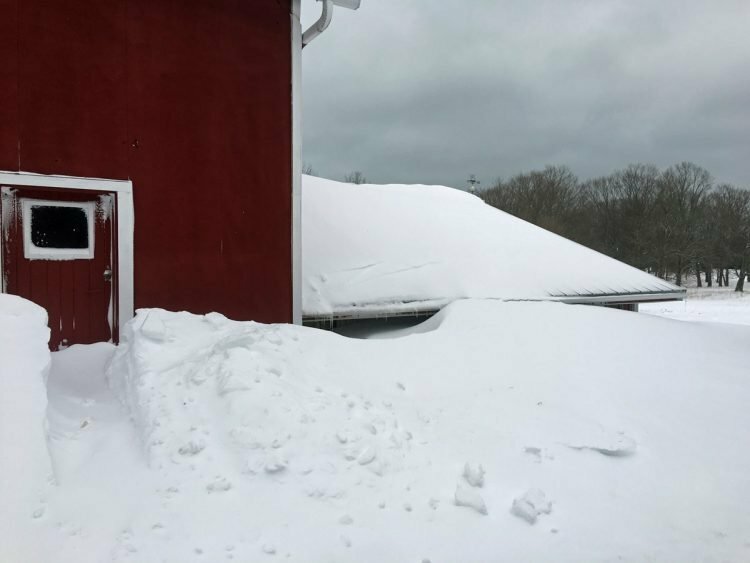 I never was able to dig all the way down to ground level, but at least we could get to the door and into the barn. Luckily the lower level of the barn held up well in terms of little snow penetrating the sheep quarters. The flock at least seemed comfortable and we managed to get them well fed. In an hour after getting to the barn, chores were finished. It was now time to return to the house. All of our excavations from an hour earlier had disappeared completely. So we just re-shoveled, knowing that this would repeat itself over and over again. Sunday the snow and wind did not let up. This was the view out the back door Sunday morning before we headed to the barn. Our previous path was gone, completely! From part way to the barn, the view back to the house was telling. 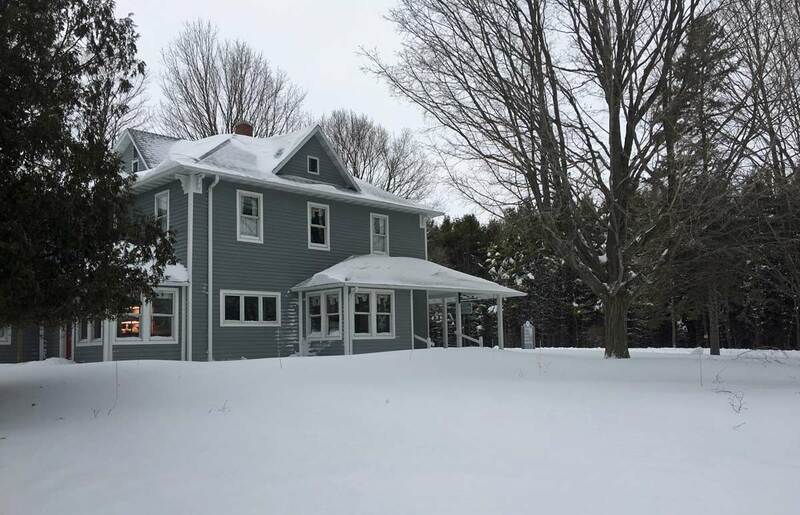 There was lots of snow, and this is the side of the house that was relatively drifted clear! 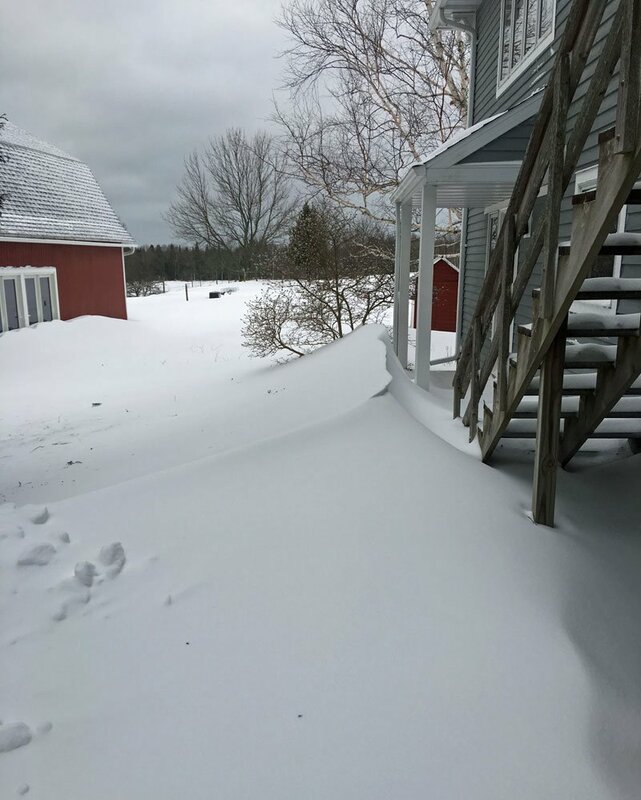 By this time the drift next to the barn had grown further. It is going to be a long while before this mass of snow disappears. The space behind the drift was by then a drop of at least 3 feet. There would be another 2 feet of snow to get to ground level. Our disappearing pathway into the barn had now evolved into a series of snow steps. It was strange having to walk up and then down to get to the barn door level. By the time this picture was taken the snow had let up enough that the path would not have to be completely re-dug, but there was still enough to remove (once again!). Then, of course. there was always the return trip to the house. The walkway to the door actually curves far to the right. Our temporary path is a couple of feet of snow on top of one of the flower beds. Eventually the storm abated. It was reported that we had about 30″ in total snow fall. 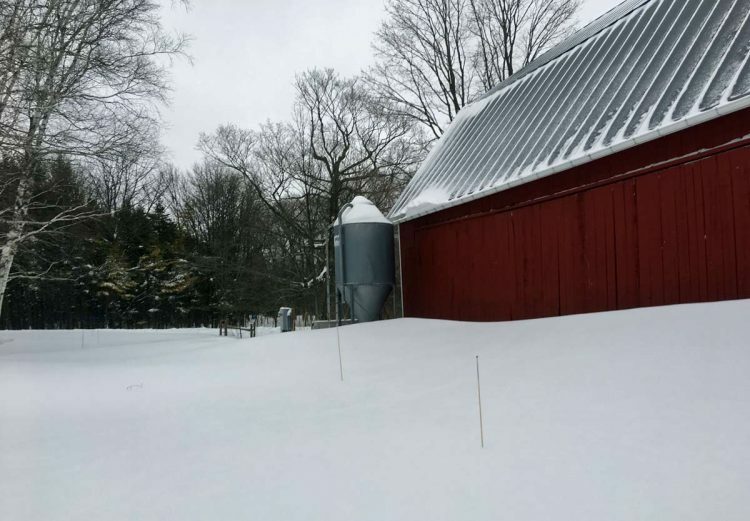 There is now going to be a lot of melting before spring planting can begin and green grass appears in the pastures. Over the last couple of days the weather has warmed up significantly. Our large flock of Robins had subsisted for a week by eating the old apples left on our crab apple trees. There are now enough exposed patches of ground that they are able to do better food wise. I have seem very few of the warblers that were here so recently. One wonders what the bird mortality was due to this storm. Yesterday (Friday the 20th) I finally managed to remove all of the snow from our driveway and walks. It is nice to once more have more than one door accessible into the house. Yesterday I also shoveled out the last of the snow steps into the barn; all that is left is a three foot deep path. The weather forecast is for more sunshine and warmth. As strange as it seems, out barn swallows returned yesterday afternoon when three flew into and through the barn. 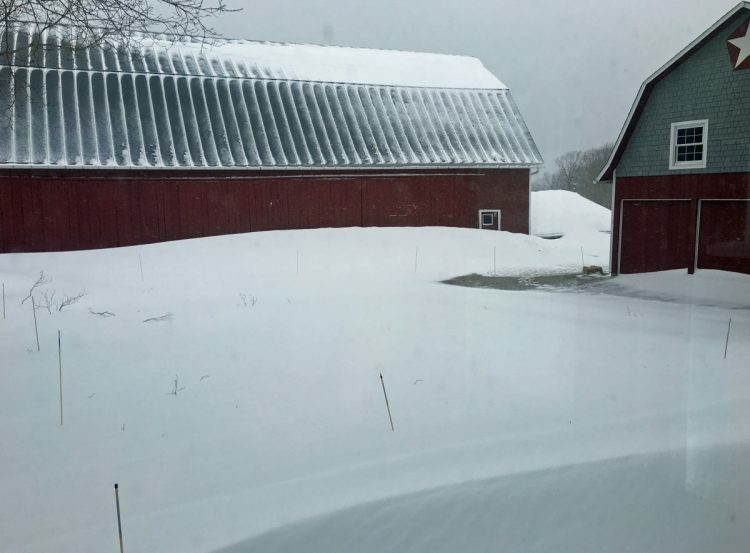 It was luckily warm enough that the upper doors to the barn were open. This morning the numbers of swallow had increased. It is obvious that these are returning swallows as they are immediately landing on last year’s nests and carrying on long conversations about the state of everything. Besides sunshine and warmth, these characters make you hope and believe that spring might soon be here. I envy the energy you two have. Do you ever have “help” to assist you in bad weather? You two are amazing. It has been 14 years since my husband passed – a few months after our last visit – but I have fond memories of all our visits to the farm. I still do a lot of knitting, but not much spinning or weaving. I truly enjoy your website. Fond regards to you both. It is always nice to hear from you Georgiann. We manage on our own. The big problem with a storm of this magnitude was that if you needed “outside help”, it could not get here. In most cases, everyone was just snowed in. It was a long time before we had the first plow go by, and we are on a County road. The Township roads got plowed a lot later than ours. I enjoyed reading your view of the spring blizzard of 2018. This is a storm our great grandkids will be talking about! Here in Baileys Harbor we also got 30 inches of snow. It has melted considerably in the past few days. I’m glad your fleece sale was a success and that your flock was safe and enjoyed their snow days in the barn. We had a “nice” snowfall, but not nearly what you had. Did have the high winds however. We’re pretty much melted now, but everything really wet & soggy. No cleaning up the yard for quite a while. So enjoy your Ewe Turn Blog & great pictures. Glad your fleece sale went well! So enjoyed seeing you both & glad we weren’t snowed in! WOW, what an experience, we are behind on everything, Amy, Mary J, and Carolyn are looking forward to their visit. had to ask why no snowblower? There definitely is a snowblower in the family! I would never had made it without my big, walk behind Husqvarna. It was, however a slow process. Four foot drifts are a bit of a challenge.